I had been talking with Ms. Sanna Kärkkäinen, director of Rovaniemi Tourist Information. I explained our mission. Angelo and I were doing the Diamonds of the Arctic Tour 2014. We were touring the road between Rovaniemi and North Cape. We needed a guide in Rovaniemi. The girl who helped us knew every tree in the forest. It had been a busy and delightful day. She was professional to her red fingertips, Ms. Marja Jalkanen. The mother of grown up kids made one last favor of the day. The Forestry Museum of Lapland was already closed. Now what? The museum is mostly open-air. Aye, we decided to trespass. Nay, we didn’t jump the fence, we crawled under it. The famous psychologist James concluded that what you do, especially when it’s done over time, you will fancy. Finland is 80 % trees and has 187 888 lakes. What do the Finnish people love? I don’t have the same love. I’ve lived by the coast most of my time. We all have our destinies. Not only is much of Finland forests, but a number of trees are protected in National Parks. One third of the country is Lapland. Later, on our tour we will visit the Urho Kekkonen National Park. By the way National Parks in Finland is administrated by Metsähallitus. A literal translation results in forestry administration, but it is an organization taking care of all state-owned land. The trees are very important to Finland, and in particular Lapland. The development of forestry was instrumental for creating the modern Finnish society. A lot is connected to forestry, says Marja. For 700 years Finland had been connected to Sweden. In 1809, Russia took the reins. The first industrialized forestry started in 1820 – 40. The big development of forestry in Lapland and Rovaniemi was, in fact, initiated by the Norwegian entrepreneur Mr. Terje Olsen. Around 1870, Olsen had decided to become rich as fast as possible. Workers scuffled to get a job in Rovaniemi. 10 000 men and women tried to fill the 2 000 employment rooster for every winter. New effective ways of producing paper and other tree-products were incorporated. The contemporary high-tech led to the first national newspaper and so on. 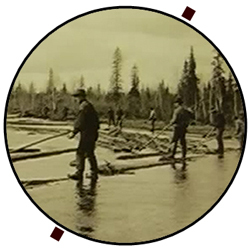 Floating the timber on the rivers became another high-tech development of the era. In the winter, the trees were cut, and transported to the rivers. In the summer the timber was transported to the saw mills. This was hard work, both for men and horses. The work was back then not as respected as it is today. The woodsmen earned money they would send to their families, or spend in blooming Rovaniemi. 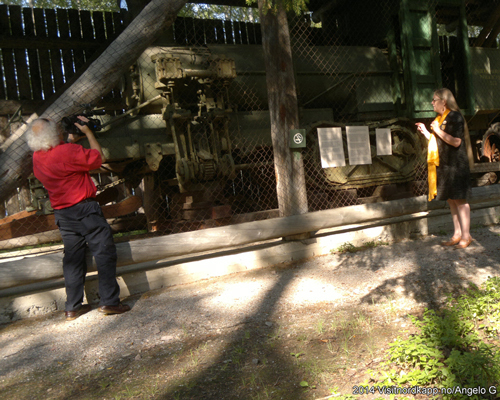 At the museum, you can see the equipment, buildings and other details from the era turning trees into wealth. In 1968, when the old way of working the forest was fading, the bosses decided to safe keep the centenary of modern forestry. The museum was established. In 1991, the last timber floated down the Kemijoki. Forestry has also branched off to other pastures. Many cabins, facilities and other things in the tourist industry is forestry know-how. It is all about making the best of what you have and love the most. This had been the only museum I have visited in Finland, where most of the outdoor posters and signs were in Finnish. As we were coming to the end of the open-air part of the museum, Marja got sparkles in her eyes. Now, I will show you the jewel in the collection: The diamond. The locomotive of Mr. Hugo Sandberg (1849–1930) was a massive undertaking before WWI that didn’t succeed. Floating was an easy way to transport timber to the mills. However, some of the forest was not close to a river. The distances were too long for the slow but powerful Finnish forest horse. An alternative was a locomotive. He sent a man to the USA to buy two locomotives. Then, 500 men built a road for the monster machine. Part by part the locomotive was brought from Rovaniemi to the forest. This was hard labor; just the kettle weighed 7 tons. But, it didn’t pan out. The machinery was not built for the cold winters, spare parts were hard to get, and it just became too expensive. Every nut, bolt and part ended up at the museum. This was also our end to the visit at the museum of forestry. We crawled underneath the fence to get out.